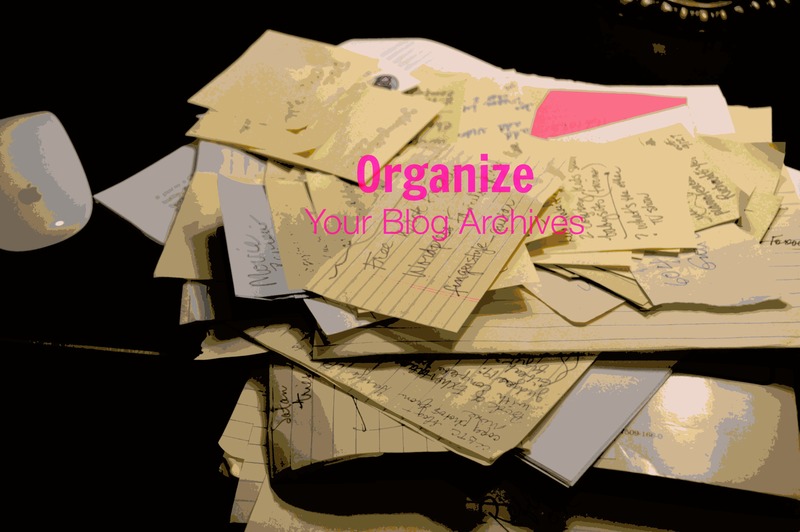 Do you ever check out Archives on blogs you regularly read or occasionally visit? I’m embarrassed to say I have an Archive button that’s like turning on to a DEAD END street. Oh, you can search posts by month on my blog. So that’s good, but not really useful to a visitor. You know that feeling when you go into a business, a store, or an office, and whoever is at the counter just ignores you? I feel that way when I get to a blog and there’s no organization, no structure. It’s like a 12 step thing, or Promise Keepers. I need the accountability to shame me into making this a priority. Also, I need PROFESSIONAL HELP. I thought assigning a category was all I needed to do to organize my blog. The problem is that I’ve overused some like Faith which now has 110 posts. Like an old attic with generations of accumulation covered in cobwebs, you couldn’t find anything even if you really wanted to. One day I was reading a post on Grace Covers Me and I noticed her Archives. That’s when the idea for this post began. There’s an elegant simplicity to her organization: alphabetically arranged categories. Why didn’t I think of that about 250 posts ago??? On her blog I found I could select a general subject from the Archives and then a title that sounded interesting. She flags new entries, although I don’t know what criteria she applies. I just know that I can quickly get to a topic that I’m looking for and discover others that I hadn’t originally been seeking, but find irresistible. So help them out by making it easy to find. When I searched for Blog Organization, Google gave me gretchenlouise.com. Her Top 10 Questions post and her 3-Steps-to-Organize Archives post are where I began, but not where I ended. I bookmarked her blog for future reference! I love your blog, yes, your blog! Got any tips to share about keeping your Blog’s ducks in a row? Since I completed this post we found out we had a leak under a refrigerator and now we have MOLD. So my house is taped off like the scene from ET when the government surrounds the Elliot’s house. Tomorrow they come for demo which is short for demolition. Oh, that doesn’t sound good at all. So the blog organization just got put on the back burner. Just make sure to wipe it up before 72 hours goes by!!! I’ve been wanting to do this too, Kelly. Seems like my todo list is just too long. I wonder if the other blogger manually adds each post to her archive list? I’m guessing so. That will take me forever! Check out how I did mine- http://40yearwanderer.com/blog/posts-by-excerpt/ . I think it’s working pretty good. It gives excepts… But still would love to have the topics be there too. Hmmmm… todo just grew again. Hope the mold is gone soon! Going to check yours out Heather. Are you using a custom theme? With you on that! I kind of enjoy letting WP. com do the heavy lifting ;). Your blog looks great. If it ain’t broke don’t fix it!!! Mold is almost evil. I hope you destroy it! This category thing has always confused me and I am pretty sure I’m not doing it right. Yet one article I read on this states that it isn’t needed. Go figure. WordPress has their own ‘language’ like medicine, law, and technology. I wish they’d put out a version in PLAIN ENGLISH for us non-coder types. The mold’s days are numbered! Code is fun, I enjoy messing with my site CSS, and would do the same with the PHP code but WP.com does not allow for that side. Mold is very dangerous isn’t it. It gets a foothold in homes here in the hot desert too. Have you thought of WordPress.org? You can utilize plugins and code to your heart’s content. I bought all the StudioPress themes on sale and have another site on WP.org for our Bible Training Centre in Ghana. Code freaks me out, but I should learn to code because it opens up so many possibilities. What a sense of humor, Kelly! I love it!! We can’t find our way out of the room sometimes for the “stuff” which collects around us. We gotta get moving on Spring cleaning! The only things touching the garage floor are car tire!!! We scrubbed it with bleach and a cleaner. Good riddance ;). I don’t think Beatrix Potter felt the same about rats as I do!!! They’re disgusting. I try to love all of “God’s creatures,” but I’ve got a looong way to go with rats and such!